A&D's DVR8008/ 16 series Digital Video Recorder have total functions both of igital Video Recorder (DVR) and digital video server (DVS). Our computer based DVR runs on Win NT & 2000 platforms. The DVR8008/ 16 uses MPEG-4 ACE and H.264 HD technology standard of high-performance video compression and G.729 Audio coding standard. It achieves video & audio real-time and hardware synchronous compress completely, and it also achieves these functions such as compressed coding stream recorded in hard disk ,real-time video & audio preview , switch video signal and audio signal , play back the local record files, real-time network transmission, playback and download long-distance files, support stream protocol (RTP/RTCP, RTSP), support IE browse, support bi-direction dialogue and so on . The DVR8008/ 16 unit consists of basic part and expanded part. The basic part includes main PCB, embedded software, machine box and power supply. The basic part of the DVR consists of the mainboard; which is the most important piece within the entire DVR due to its capability to support hardware read-write, net communication, play-back of stored files, alarm input and output, RS-232/RS-485 port and etc. ▪ MPEG-4 Hardware compression Board achieves video and audio real-time compression. Different application requires different video and audio channels as well as compression board of different channel number. ▪ Real-time video and audio preview Switch Board achieves screen division and matrix switch. Now it supports to divide 9 screens, and recognize video and audio real-time preview, 8 channels of video and audio matrix switch and it also can be used for long-distance net transmission of any video and audio signal channel but have no effect on local real-time record. ▪ Dialogue Board It supports bi-direction dialogue. ▪ Stream and Web Server Module Stream protocol ensure net communication will become more steady and thorough, and it achieves alterable code ratio and alterable frame ratio. ▪ Support maximum of 16 video signal channels, and each channel can recognize real-time 25F/S(PAL) or 30F/S(NTSC), and CIF resolution. Video compression uses MPEG-4/ H.264 compression technology, and it can support not only alterable code ratio but also alterable frame ratio. At the same time as set video image quality we can limit the compression code stream of video image. ▪ Support four record models: time record, manual record, motion detection record and alarming record. ▪ Support multi- resolution, from 1/2 D1 (704 x 288) to QCIF (176 x 144). ▪ SSupport real-time preview of video images and video signal switch. ▪ Support play back from hard disk files. ▪ Support motion detection for multi-area. ▪ Support OSD, position of date and time, adjustable hue, date and time can increase automatically. ▪ Support translucent or semitransparent LOGO, the position of a LOGO can be set on everywhere in the video image, and it is especially fit for the application of concentrated vigil or part of image needed kept out. ▪ Support one Ethernet port of 10M/100M. ▪ Support one RS-232C port. ▪ support link and draw of MODEM. 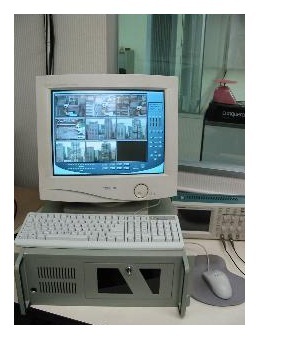 ▪ Support TCP/IP protocol; can set parameters through internet applications or browser, real-time browse video and audio signal, examine the state of video server, and it also can alarm and store compressed stream through network. ▪ Control circumvolve of platform and relative parameters of pick up camera, for example: size of aperture and length of focus and so on. ▪ Can independently browse each channel or multi video and audio signal through network. ▪ RS-232 port and RS-485 interface all support net translucent channel link, and PC management host computer can control serial server through the translucent channel of Net DVR. ▪ Video server can support 8 IDE hard disks, and the capacity of each hard disk can reach up to 160GB. ▪ Hard disk file system is compatible with DOS system and can be operated on PC platform. ▪ Files in 8 hard disks can be recorded circularly. ▪ Through network management host computer can download the files on HDD and also can play the recorded files on Net DVR.